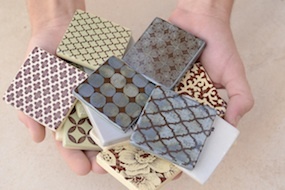 Kt tiles offers a uniquely conceived and utterly handmade tile collection. The tiles are individually made from scratch, glaze fired and then a design decal fired onto them. 100 x 100mm and are perfect when used as splashbacks on the wall, either in the bathroom or the kitchen. We also do commissions, where you can use images of your own choice. The collection is continually growing with new one-of-a-kind designs.